Concentrated gel serum containing calming active ingredients, Chamomile and Aloe Vera, which restores and nourishes your skin. This unique gel formula allows the serum to be absorbed quickly . Ideal for use under your daily cream and make up. Direction for use: Apply a thin and even layer on your face and neck, massage gently, Allow complete absorption. For best results apply morning and night and complete with moisturizing /nourishing cream. 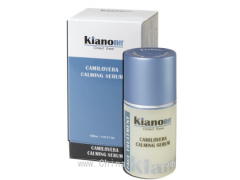 Tips：This page [CAMILOVERA CALMING SERUM] infomation provided by [Israel Pharma Naturalis Ltd] ,the enterprise is responsible for the authenticity, accuracy and validity of the information content. www.tradeleo.com do not assume any guarantee of joint and several liability. A safe way to suggest that the two sides trade, to ensure the interests of both sides.